An intriguing, provocative psychological thriller that’s an innovative example of neo-noir avant-garde cinema with a touch of mystery. Gore Verbinski’s A Cure for Wellness is a thought-provoking film that hooks you from the very beginning and continues to draw you into the narrative with its labyrinth of subplots and incredibly beautiful cinematography. 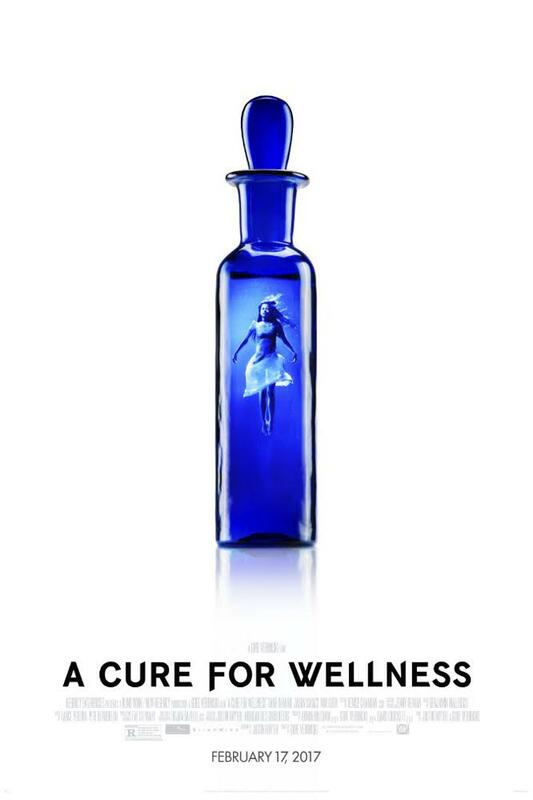 Although it certainly borrows turning points and plot devices from past films, A Cure for Wellness provides audiences with an experience that is unique and protects the film from being pigeonholed into any one sub-genre of horror or directly compared to other movies that have similar attributes. With impeccable production designs and serene landscapes juxtaposed against cringe-worthy disturbing imagery, Verbinski’s ambitious film is one that cinephiles will appreciate and find enjoyment in discussing the various themes, symbols, and visual storytelling elements that seamlessly work together to create a cinematic experience that stands out against the homogeneous horror/mystery-thriller past films. Justin Haythe’s screenplay sets him up for continued success as he demonstrates, with this film, that he can cross into new genres and hook the audience early on. Despite the occasional slow-burning periods in the narrative, you will not likely feel the nearly 2.5hr runtime. After he receives a corner office in a high rise building, a stock broker finds himself involved in an investigation that requires the presence of the entire board. Mr. Lockhart (Dane DeHaan) is forced by his fellow directors, on the board, to fly to Switzerland to retrieve the CEO in order to complete a proposed merger to save the company from closure. Little does he know that those who voluntarily check in to the mysterious wellness center seldom desire to leave the prestigious mountaintop retreat-like spa and its famous water. When the CEO of his company refuses to leave the comfort of the retreat, Lockhart decides to wait it out in the village below the hilltop. After a bizarre car accident on his way back into town from the institution, Lockhart finds himself a patient due to his broken leg. Under the guidance of Dr. Volmer (Jason Isaacs), Lockhart experiences all the wellness center has to offer to the patients and guests. However, he cannot help but feel that there is a darkness surrounding the cult-like daily operations at the spa and begins to dig into the history of the prestigious wellness institution. After meeting a rather unusual patient at the institution named Hannah (Mia Goth), Lockhart is determined to unravel the mystery of how so many people, including himself, are diagnosed with the same bizarre ailment that keeps them there for the cure. Beautiful. The first cinematic element that will jump out at you will be the incredible cinematography and picturesque landscapes of the Swiss Alps. From the moment the film opens, there is a tone that inspires you to look at and listen for details throughout the film. The fact that the teasers and trailers reveal very little about the plot is beneficial to the overall experience of the film. Just when you think you have the plot figured out, you will be thrown for a loop and question what you thought was predictable. In all fairness, I figured out a very important aspect to the plot midway through after a particular line delivered by one of the central characters prompted me to have one of those aha moments. However, I was still continually intrigued by the film’s diegetic delivery and visual storytelling. The fact that I figured some rather crucial information did not detract from the experience. Early on, it is clear that there is something not right with the spa, and gathering information and piecing together the puzzle will draw you in closer to the film. Without giving anything away, there are definitely clues along the way that reveal the dark mystery and history behind the exclusive mountain retreat wellness institution. Dane DeHaan delivers an excellent performance as Lockhart, and provides the perfect balance of entitled Wall Street prick, detective, and humanitarian on a rescue mission. Jason Isaacs, no stranger to playing a creepy villain, delivers a disturbingly convincing performance as the strange doctor overseeing the almost clandestine treatments for an unknown sickness. Mia Goth’s performance adds a great deal of uneasiness to the film by coming across as innocent, child-like, all the while hiding something creepy and peculiar about her very pretense at the facility. Bojan Bazelli’s cinematography is breathtaking and is successful at completely immersing the audience into the mountain top world of the Swiss Alps. Whether following a train or an extreme close-up of the human eye (a staple in horror films), the visual art he paints with the camera serves to provide solid visual storytelling. Directing such a complex film requires great patience, organization, and effective guidance. Verbinski channels his success with The Ring (2002) by integrating some similar stylistic techniques in A Cure for Wellness. Speaking of the title itself, the irony in the title isn’t realized until the third act; but, delivers an outstanding payoff that will prompt many discussions in a film studies class. Stylistically, the film sits at a crossroads between avant-garde horror and neo-noir with some science-fiction and mystery thrown in for good measure and intrigue. Despite many reviews slamming the film for a complex system of subplots and not enough traditional terror in the narrative, this film is a fine example of an outstanding vision that is seldom seen on the silver screen due to the fact that it will not likely make a lot of money, but it adds critical value to the art of motion pictures. Instead of creating a film that would have included many of the more typical tropes in this hybrid science-fiction mystery/thriller, Verbinski chooses to meticulously craft art for the screen. For the squeamish, there are definitely some scenes that will churn your stomach and even some disturbing imagery that many will like to unsee. If you enjoy avant-garde cinema or even innovative neo-noir storytelling, then you will likely enjoy this film and appreciate the vision of the director as well as the beautifully complex themes, subplots, and symbolism.